Batteries Direct sells the V-Tech 80-4032-00-00 manufactured by Jasco for only $13.99. That is the total cost. There are NO shipping or handling charges. Batteries Direct also backs up the V-Tech 80-4032-00-00 Battery sale with our One Year Power Performance Pledge™ No-Hassle Warranty , Money Back Guarantee and Toll Free Customer Support. We hope you will choose to buy your replacement V-Tech 80-4032-00-00 Battery from Batteries Direct. Batteries Direct is a service oriented company that has been online since 1996 and we want to make you a lifetime customer. What exactly is a V-Tech 80-4032-00-00 ? 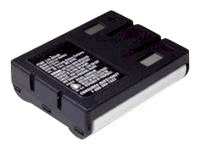 The V-Tech 80-4032-00-00 is a cordless telephone battery used in over 200 different mostly V-Tech telephones. The battery is also used in several Sony, AT&T, Panasonic cordless telephones as well. We have provided details concerning the V-Tech 80-4032-00-00 battery in the text to follow. Hopefully this information will give you the knowledge you need to make an educated buying decision when purchasing a replacement VTech 80-4032-00-00 battery pack for your telephone. What are the specifications of the V-Tech 80-4032-00-00 battery Pack? Most V-Tech 8040320000 batteries are rated at 3.6 volts and 700 mAh (Mili-Amp Hours). Sometimes you will see higher or lower mAh ratings. The mAh number is the measurement of the "capacity" of your 80-4032-00-00 battery pack. The higher the Mili-Amp Hour rating, the longer your run time. For example, a 600 mAh cordless phone battery will give you twice as much talk time when compared to a 300 mAh (half of 600) battery pack. What is the normal useful life of a V-Tech 80-4032-00-00 Battery Pack? Most consumers get between 3 to 5 years of service from their V-Tech 80-4032-00-00 phone battery before needing a replacement. This lifespan depends, of course, on individual patterns of usage. But I thought all V-Tech 80-4032-00-00 batteries are rechargeable. So why do they wear out? My V-Tech 80-4032-00-00 battery has a black wrapper. I see different colored telephone battery packs available. What is the deal? Is that ok? Yes, that is ok. Several different companies manufacture and market their own version of the V-Tech 80-4032-00-00 battery design to customers. Many times these battery manufacturers use different colored plastic shrink wrap as part of their marketing and "branding" efforts. We have seen white, green, red, yellow, blue and tan to name a few! Rest assured, the color of your V-Tech 80-4032-00-00 plastic battery wrapping is cosmetic only and unimportant. What is very important is that the form factor (size), polarity (orientation of the positive and negative contacts) and of course the voltage of your 8040320000 must be exactly the same. How do I make certain I'm getting a quality replacement 80-4032-00-00 battery pack? That is a good question. It is difficult to sort out the variety of offerings out there on the internet. Sure, you can find websites selling replacement V-Tech 80-4032-00-00 batteries at prices from $7.95 to $19.99 for what looks like "the same" (in the pictures at least) V-Tech 80-4032-00-00 battery. Our experience indicates that it is true - you usually do "get what you pay for". So you need to use some common sense. In this particular example, there is definitely something wrong with the two price extremes. Certainly $19.99 is way too much to pay for a V-Tech 80-4032-00-00 battery pack. Somebody is just trying to make a lot of money! And in most cases, $7.95 is just too good to be true. We get concerned about the quality of the materials (battery cells), safety features, and quality control process to insure the correct precision fit and finish of the 80-4032-00-00 battery. At that price, one has to wonder - if it is is in fact a brand new 80-4032-00-00? Unfortunately there are probably some "refurbished" or damaged goods out there on the market at some of those low prices. In addition many of these low teaser rates do not include shipping or handling charges. Oftentimes that "$7.95" V-Tech 80-4032-00-00 cordless phone battery ends up being $18.99 or more after the hidden shipping and handling charges are added at the end of your checkout proceedure. So make sure you are looking at the final whole price of these "great deals". What should I look for when buying a replacement V-Tech 80-4032-00-00 battery? If you are interested in buying a quality replacement for your V-Tech 80-4032-00-00 battery, go with a proven company that offers at least a 30 day money back guarantee, a one year no hassle warranty, gives you a toll free customer support telephone number, and clearly identifies the total cost of the purchase including any shipping or handling charges upfront. © 2018 Batteries Direct, Inc. All rights reserved.